Internet Archaeol. 40. Atkinson and Preston. 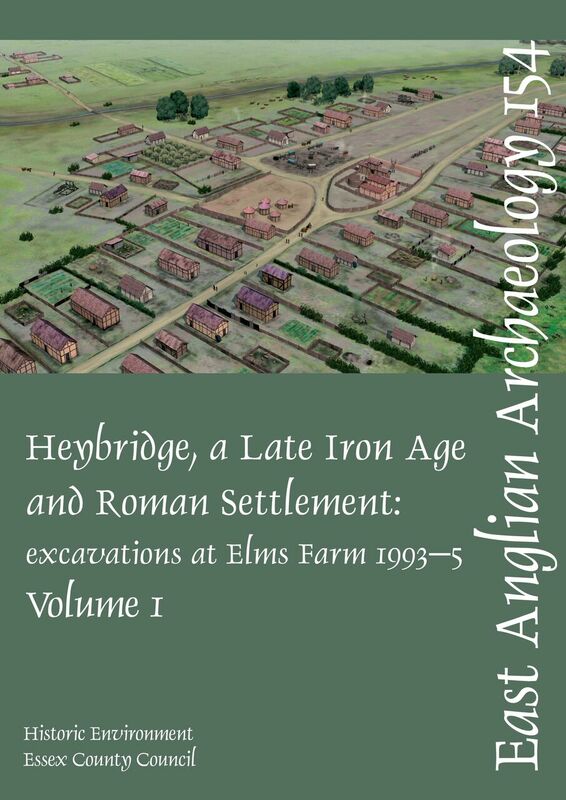 Heybridge: A late Iron Age and Roman settlement. Excavations at Elms Farm 1993-5. Volume 2. Summary. 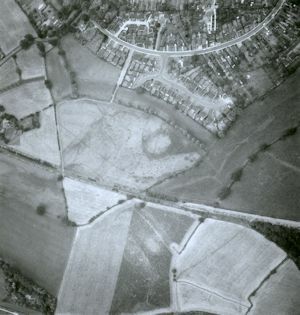 The Late Iron Age, Roman and early Saxon settlement at Elms Farm, Heybridge, Essex was excavated in the mid-1990s, in advance of the construction of a large housing estate by Bovis Homes Ltd. The total development area comprised c. 29 hectares, of which some 18ha were subject to varying degrees of investigation by the Essex County Council Field Archaeology Unit (ECC FAU). The large-scale of the excavations is matched by the substantial and important artefact assemblage recovered, which included 6.4 tonnes of Late Iron Age and Roman pottery, 2,910 Roman coins and over 9000 animal bones. Together this has enabled an appreciation of the development of the settlement over time and space, of the changing functions, status and economy of individual areas and the settlement as a whole, and the issues of transition, change and finally decline. The site revealed evidence for activity from the Bronze Age to the post-medieval period. The evidence for the earliest settlement dates to the Late Iron Age period (mid 1st century BC) and is rather fragmentary in nature. However a centrally located shrine, with a series of strip-plots to the north and south were tentatively identified. This settlement was remodelled around the mid 1st century AD, with the creation of a formal infrastructure of metalled roads, as well as a new temple precinct on the earlier sacred site and a reworking of the strip-plots into enclosures. This remodelling spanned the Late Iron Age/early Roman transition period, although the new road network is tentatively dated to the decade or two preceding the Roman conquest. To the north of the settlement area were a number of burials, pyre sites and pyre debris dumps. Early Roman cremations were added to this area slightly later. Some of the pyre sites exhibit higher-status elements, and at least one may have been 'aristocratic', suggesting the presence of a local elite. The later 1st to mid 2nd centuries saw a period of broad continuity and development. 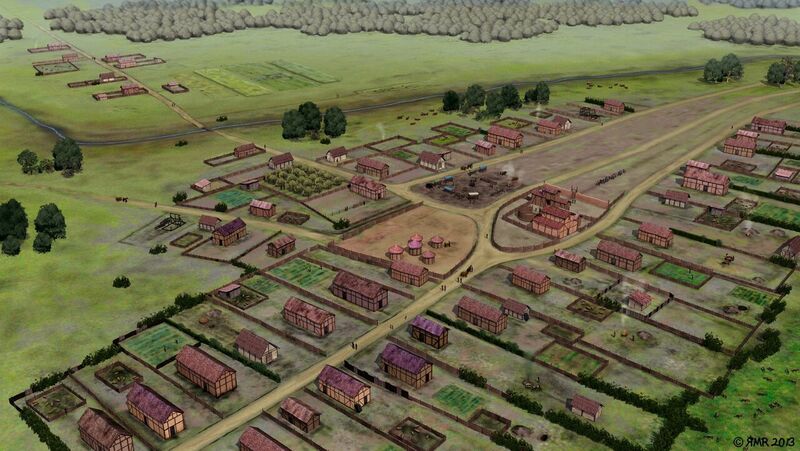 With the essential infrastructure already laid down, there was little substantive change made to the roads or to the layout of the settlement, and little change is evident to the functions of individual enclosures. The exception is the temple precinct, which underwent a second phase of remodelling in the early 2nd century with the adjacent areas adopting a support role in relation to it. 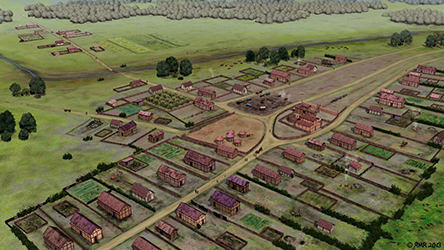 The finds and the layout of the settlement suggests a decline in its status, with the settlement acting as a large village or small town with a market and religious function. The late 2nd to mid 4th centuries saw occupation activity contracting towards the settlement nucleus, which is conjectured to lie to the west of the temple complex. Much of the remaining area was increasingly given over to peripheral, perhaps purely agricultural, uses and the side roads were gradually going out of use. The evidence for the latest Roman and early Saxon periods is again rather fragmentary, although the continued decline and contraction of the Roman settlement toward its core to the west of the area of investigation is evident. The main thoroughfares may have survived to the end of the Roman period, but all around the infrastructure appears to be fragmenting. However, the religious focus functioned into the late 4th century, when the precinct wall and adjacent monumental post were removed and a substantial building was placed over the former boundary. It is tentatively suggested that the new structure could have been an early Christian chapel. What remained of the former Roman settlement into the 5th century, and whether there was continuity of occupation into the early Saxon period, is unclear. Early Saxon material, was recovered from across the site and a number of buildings are identified. However, on the basis of the evidence from Elms Farm and from other excavations in the area it is thought that the main focus of the early Saxon settlement was on the marginally higher ground to the north-east in the area of the modern Crescent Road. The final episode of occupation at Elms Farm does not appear to have lasted beyond the 5th century. The economic focus of Elms Farm appears to have been primarily agricultural, with cereal growing and processing, as well as stock rearing. In the earlier periods wool processing and textile manufacture played an important role in the local economy. The site’s estuarine setting provided secondary economic resources, there is evidence for inshore marine fishing and for the harvesting of oysters. A range of manufacturing activities were undertaken, largely on a scale commensurate with the basic requirements of a substantial settlement and its population. This included evidence for metal-working, pottery production, bone-working, and textile manufacture. 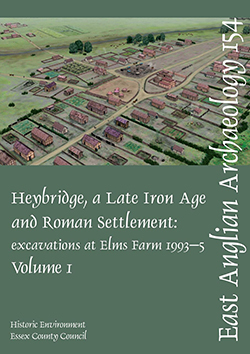 This monograph (Volume 2) presents the stratigraphic descriptions and specialist reports of the Late Iron Age, Roman and Saxon material while the companion East Anglian Archaeology synthetic report monograph (Volume 1; Atkinson and Preston 2015) presents the synthetic discussion regarding the site. The prehistoric activity has been previously published in Britannia (Atkinson and Preston 2001) and the post-Saxon material (which is negligible) has been incorporated into the digital archive (Essex County Council 2015). Along with the digital archive, hosted by the Archaeology Data Service, it is hoped that all these dissemination strands form the basis for future research and re-interpretation.